When going into a construction management business for yourself, a good plan can often make the difference between success and failure. Starting a new business off on the right foot may not guarantee success, but it positions you much better for what lies ahead. 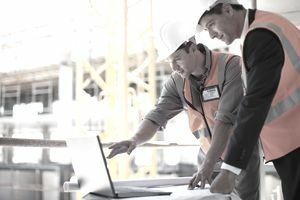 The initial process of starting a construction management business can be broken down into eight steps. A business plan is important for two reasons: It is a huge part of what lending institutions use to gauge whether they want to help fund your business, and it helps you clarify in your mind the direction you want to take your business. "Construction management" is a broad description; you need to narrow it down. Do you plan to do residential or commercial construction? Will you specialize in new construction, or will you focus on improvements, remodeling, and additions? With the right roadmap comes the right focus. If you don't know how to write up a business plan, there are numerous training resources out there to help you get started. Construction companies almost always work from a central headquarters, whether they operate within a specific geographical radius or they have satellite offices in numerous cities and states. Decide how to best serve the clients you hope to reach. Where you set up shop will largely determine how accessible you are to current and potential clients. It is absolutely critical that you have the money in place to do what you want to do with your business before you even begin advertising or bidding. You will need to secure loans, find investors, or apply for grants to get your business off the ground. What type of corporation will best suit your business? For example, if you plan to go it alone at first, you might opt for a sole proprietorship. If you're teaming up with someone else, consider a partnership. If you're hoping to expand quickly and hire a full staff, you might be better off with an LLC. There are numerous possibilities that a corporate attorney or CPA can help explain. The name of your business will complete the phrase, "Doing business as..." This step is simple: Just register your business name with the state government where the business is headquartered. You will need to be registered in the state in which your business is headquartered to obtain unemployment, worker's compensation, and–first and foremost–a Tax ID number. You may want to consult with an attorney or CPA regarding your Tax ID because there are different types. A good CPA will often have a better grasp on which number you need (from both the IRS and the state) than a lawyer will, and a CPA will charge less to set it up. Find out what licenses and permits you will need at the federal, state, and local levels. In construction, there can be a lot of these, so it's a good idea to run your list by an attorney to make sure you aren't missing anything. Each state has specific legal steps that you must take when dealing with employees. A clear understanding of these procedures will help you avoid legal entanglements down the line, both in terms of whom you hire and, unfortunately, whom you fire.